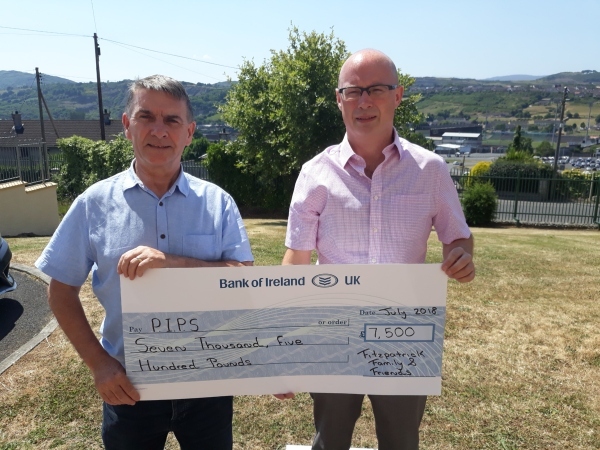 The Fitzpatrick family from Burren, over the recent months have organised very successful fundraising events for PIPS Hope and Support and Craigavon Area Hospital. The family organised a Charity Tractor Run and Dance on 2nd June 2018. The Fitzpatrick family were overwhelmed by the huge turnout and the outpouring of generosity and support in their efforts. A grand total of £15,000.00 was raised, divided equally between PIPS Hope & Support and Craigavon Area Hospital with each organisation receiving a fantastic £7,500.00. Pictured is Seamus McCabe (CEO PIPS Hope and Support) receiving the cheque from family member Maurice Fitzpatrick on Monday 2nd July. Speaking after the event, Seamus said "We would like to thank the Fitzpatrick family for their tremendous efforts in raising £15,000.00 for ourselves and Craigavon Area Hospital. The Fitzpatrick's have been exceptional in supporting the organisation and we were delighted the local community rallied around them to support their initiatives. The significant funds donated to PIPS Hope and Support will be of vital assistance in ensuring we can continue to deliver our crucial service and be the leading independent advocate in the greater area for all aspects of suicide, including intervention, prevention, suicide bereavement, including emotional/mental well-being and trauma".